In the latest in an internal political crisis rocking Egypt’s oldest liberal party, the Wafd Party, suspended board members have said they would not attend party leadership elections on Friday. On Wednesday, President Abdel-Fattah El-Sisi met with Wafd leader El-Badawy, and the leaders of the suspended board members, including Fouad Badrawy, calling for reform in an attempt to solve the party's internal crisis. Badrawy on Thursday slammed El-Siyad El-Badawy, for not making serious attempts to solve the problems within the party, just hours after praising the efforts of the presidency in ending the political crisis in Al-Wafd party. In a press statement, Badrawy announced that he and other members of the reform faction would not participate in the party’s general assembly elections to be held on Friday. "We demand that all the Wafd members fired in the current crisis to be reinstated, to reform all the committees in the party and to have democratic bylaws,” Sherif Taher, one of the suspended high board members, told Ahram Online on Thursday. “Our power comes from our base in the Wafd Party. If we are just eight members making noise, the president would not have interfered,” Taher said, adding that the meeting with the president did not reach a final solution. In April, at least 1200 members of Al-Wafd Party, including Badrawi and other leading members in the reform centre right faction, convened in Sharqiya governorate, declaring that they had withdrawn confidence in the party's current leader El-Badawy for maintaining absolute authority over all party decisions. Al-Wafd Party bylaws state that the signatures of only 500 members are necessary to withdraw confidence in the party’s head. In retaliation, at an emergency high board meeting, El-Badawi announced that the eight high board members that lead the meeting in Sharqiya -- including Fouad Badrawy, Essam Sheha and Sherif Taher -- were suspended and would be referred to investigation, as well as being banned from entering the party’s headquarters. This is not the first internal fight to shake Egypt's Al-Wafd Party in the last 10 years. 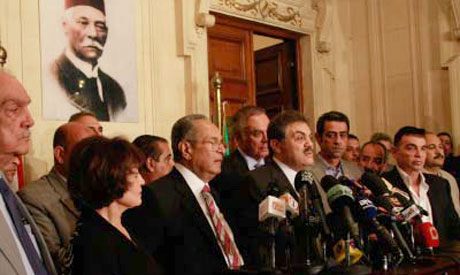 In January 2006, Wafd Party leader Noman Gomaa was ousted from his position when the high board withdrew confidence in him and appointed Mahmoud Abaza as interim leader. The founder of the party would be ashamed of you all.